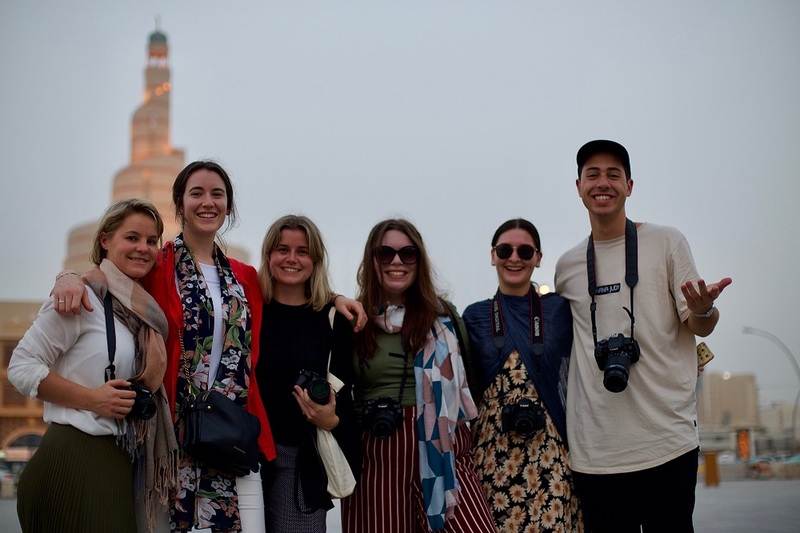 5 September 2018: From forays into the formidable media machinery of broadcasting giant Al Jazeera, to early morning photo sessions as dawn broke over the local souk – three University of Canberra journalism and communications students had an eye-opening, stereotype-busting experience in the Middle East recently, as part of the Australia-Middle East Journalism Exchange (AMEJE) program. A not-for-profit organisation, AMEJE aims to improve cross-cultural understanding by nurturing better informed journalism. The exchange programs include academic and cultural components, as well as professional and working field visits. “Even before they set foot in another country, participants take part in a 10-week academic program,” Managing Director of AMEJE, Dr Scott Bridges said. Dr Bridges also teaches journalism and communications at the University. 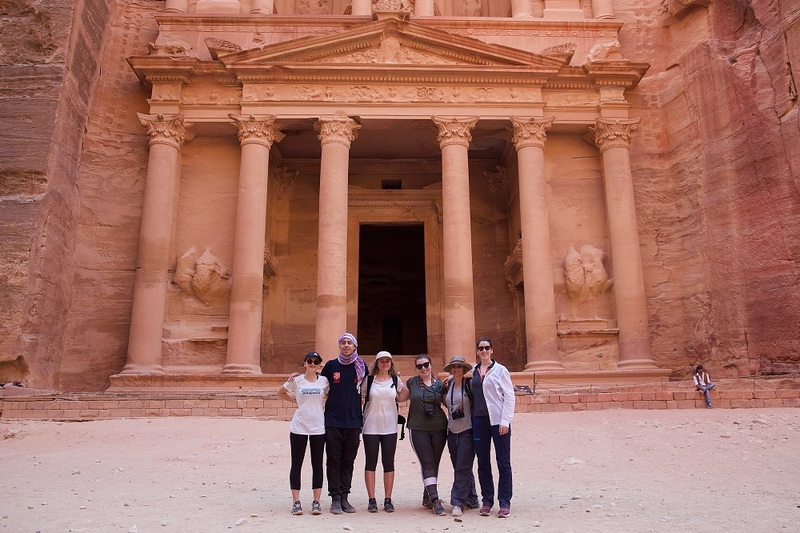 The University’s Ruby Becker, Sarah Hill and Gabrielle Kneipp were joined on the #AMEJE18 trip in July to Jordan and Qatar by University of Adelaide students Ashleigh Roberts, Benito Carbone and Dale Carter. In addition to visits with Al Jazeera in Doha and Arab Reporters for Investigative Journalism (ARIJ) in Amman, participants went to Jordan’s historical city of Petra and the Jerash refugee camp, Middle East University in Amman, non-profit organisations, museums, mosques and other cultural sites. Ms Becker also found herself on the other side of the camera when she was interviewed on local talk show Donya Ya Donya, on Jordan’s Roya TV. It was an enjoyable but intense experience – particularly since she was receiving simultaneous English and Arabic translations via her in-ear headset. The participants found that the trip transcended many expectations they had about the places they were visiting, mainly through the connections they forged with everyday people. “I didn’t expect to build so many relationships, make so many connections. It turns out, cross-cultural communication doesn’t have to be complicated,” Ms Becker said. It made them consciously consider representation and stereotypes, particularly when it came to portrayal in the media. On her return, Ms Hill found that people kept asking her whether the places she had visited were safe. “I thought it was such a strange question,” she said. “Jordan especially has been a safe haven for people escaping conflict in the region, for years now. Each participant worked on individual projects during the trip. Her interviewees were an eclectic bunch, ranging from a photographer to a guitarist, a musician, artist and filmmaker. For Ms Kneipp, the best part of the trip was getting to work in the field. One of her interviews was with Rana Husseini, the Jordanian journalist and activist who exposed honour crimes in the country, and campaigned for stronger laws against them; another was with activist Hanaa McDady, who has worked with refugees, particularly women and children. “We also visited the Petra National Trust, where they teach pottery skills to children from nearby villages, so that when they grow up, they might become involved in the conservation of the site themselves. “Everyone we met was so warm, they really gave so much of themselves,” she said. The Petra site visit was of particular interest to Ms Becker, whose project focused on the destruction and preservation of heritage, and how that affects identity. “I’ve always thought of heritage as the tangible remains of history, but from talking to a 14-year-old-girl in Jordan, I learned about intangible heritage,” she said. Professional meets aside, Ms Kneipp – a member of a dragon boat team in Australia – managed to link up with the Doha Wireless Warriors in Qatar, a dragon boat team for cancer survivors and supporters. She not only went out paddling with them, but managed to interview team members. It certainly will for Ms Becker, Ms Hill and Ms Kneipp. The #AMEJE18 study tour was supported by the Department of Foreign Affairs and Trade’s Council for Australian-Arab Relations (CAAR), the Changing Lives program, Qatar Airways, the Embassy of the Hashemite Kingdom of Jordan in Australia, and the Embassy of the State of Qatar in Australia.